The Tectum III roof deck panel is a composite of a 1½" or thicker Tectum substrate, Dow Styrofoam® brand XPS (extruded polystyrene) insulation 1½" to 8" thick and 7/16" OSB (oriented strand board) sheathing with a slip-resistant surface. 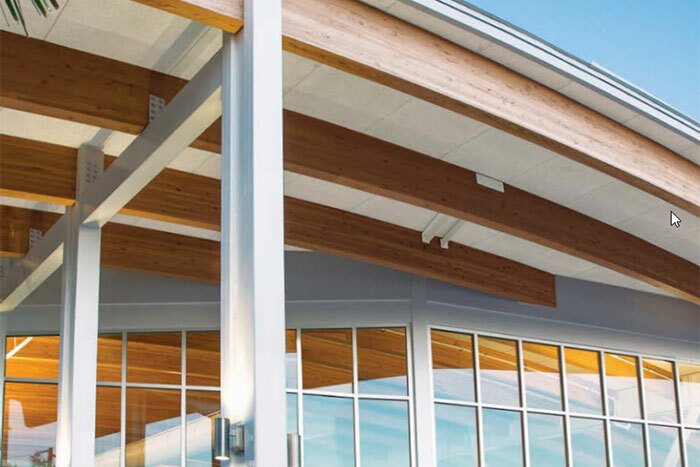 Tectum III panels are typically used in sloped applications where insulation and a nailable surface are required. Tectum IIIP roof deck is made of the same components as Tectum III, but with an edge detail specifically designed for use over high-humidity applications such as swimming pools and ice arenas. The detail, when properly sealed with urethane adhesive, provides for a continuous vapor retarder from panel to panel in all directions. All Tectum roof deck composite panels are bonded with code-listed structural adhesives.